For those of an adventurous spirit, like myself, the French label Timpani will appeal. I’ve made several interesting discoveries of long neglected and unsung composers. Louis Thirion and Antoine Mariotte are just two that immediately spring to mind. 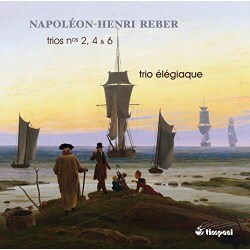 Now comes Napoléon-Henri Reber in this the second volume of his piano trios; nos. 3, 5 and 7 appeared in 2014 (review). Born 21 October 1807 in Mulhouse, Alsace, he became a student of Anton Reicha and Jean François Lesueur at the Paris Conservatoire. He was to step into their shoes, becoming professor of harmony there in 1851. He succeeded Fromental Halévy as professor of composition in 1862, being awarded the Légion d'Honneur along the way in 1855. His far from meagre oeuvre includes several comic operas, a ballet, four symphonies, one string quintet, two string quartets, a piano quartet and seven piano trios. It was the piano trio genre that brought out the very best in Reber’s creativity. His prodigious gifts as a melodist are very much in evidence in the Second Piano Trio from 1840. The Trio Élégiaque’s authoritative playing fully captures the passion and exuberance of the opening movement’s virtuosic scoring. A Schubertian influence can be detected in the simplicity of the Andantino second movement. A sprightly scherzo-like movement precedes a finale which announces itself with a noble theme. Reber’s deft contrapuntal skill is put to good use. As the movement progresses, it gathers momentum and ends in a blaze of verve and vigour. The Piano Trio No. 4 bears the title Sérénade which, as Charlotte Loriot points out in her accompanying notes, probably refers to the amorous serenade style of the second movement. It’s an intimate dialogue between the violin and cello, enunciating the passionate whisperings of two lovers, against an arpeggiated piano accompaniment. The Scherzo, in contrast, is skittish. In the finale, a dotted declamatory introduction, serious in intent, paves the way for one of the catchiest and most memorable tunes you’re likely to hear, it’s character both genial and whimsical. Again cast in four movements, the Sixth Trio is a late work published in 1876, four years before the composer’s death. Reber harks back to the classical masters in the contrapuntal overlaps of the first movement. A Schumannesque Larghetto follows, where the violin and cello are given prominence. Both the brief Allegro vivo and the finale are joyous and ebullient, and the players generate plenty of optimism. The Trio Élégiaque’s alert and committed readings bring these delightful trios to life, and their persuasive advocacy will win over many. As with all the Timpani recordings I’ve heard, sound quality is top notch, and the balance struck between all three instruments is as it should be. I would urge all chamber music lovers to snap up this album, it will give immeasurable pleasure.